Having anything stolen is a frustrating and costly nightmare. Theft is especially annoying when you’ve gone to the trouble of securing your items. Bikes, in particular, go missing all the time despite those chain locks – even the removal of tires and seats! What immediately separates goLock from other theft deterrents is that it treats outdoor gear with the same seriousness as cars or other big ticket possessions. goLock understands that you love your outdoor toys and that you’ve invested substantially in them. 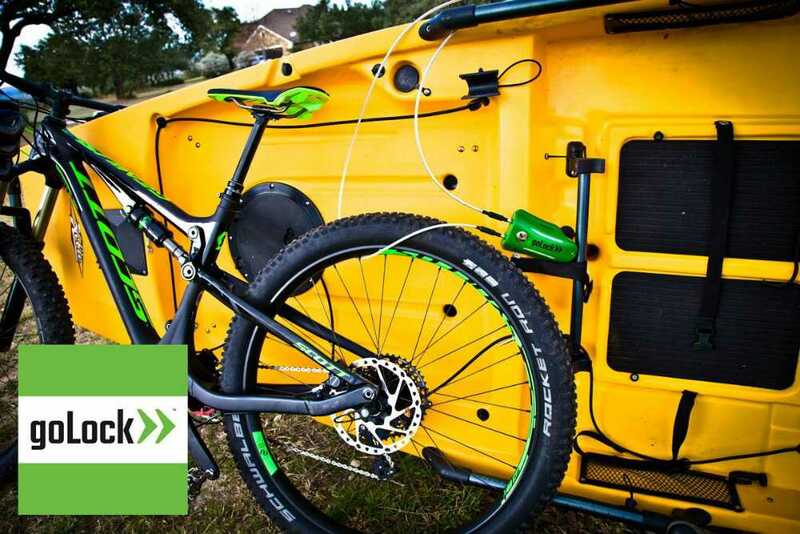 Bicycles, kayaks, camping rigs – we pay top dollar for leading brand equipment, and deserve to have it safeguarded properly. So, when someone messes with your goLock, an alarm makes the thief’s ears bleed. OK, that’s an exaggeration, but, should your lock be cut or tampered with, goLock unleashes a 90-decibel alarm that’s definitely unmissable. Since the culprit likely isn’t expecting your ATV or fishing rods to have such an alarm, it will probably prove twice as frightening. The lock system is also outfitted with a weatherproof casing and rugged steel cable loops that you use to clamp down your stuff. It’s both a rugged lock, but also flexible enough to be implemented in different surroundings. Another thoughtful touch is the availability of cables of different lengths and thicknesses to match the equipment you need to protect. On top of the effective lock and alarm system, goLock also communicates by Bluetooth and cellular device with the goLock App. If your lock is damaged or the cable severed, you’ll be notified immediately. Here, you also have the option to have other friends or adventurer companions notified as well. There’s even a quick 911 call option. Want to use 10 different goLocks on your toys and tools? The app keeps tabs on them all easily. Knowing that your gear is protected, and knowing that you’ll know immediately if something happens, gives owners greater peace of mind when using their babies out of the house. They’re spared the anxiety that often comes with leaving gear unattended. An effective deterrent and smart notification system means that you get to enjoy yourself more completely, whether you’re out skiing, hang gliding, or having lunch after a deep sea dive. And if you’re really stoked about this electronic cable lock and alarm, you can be one of the first to nab a goLock Venture by supporting their Kickstarter campaign, running until May7th. Now go guard your goods and your good times.